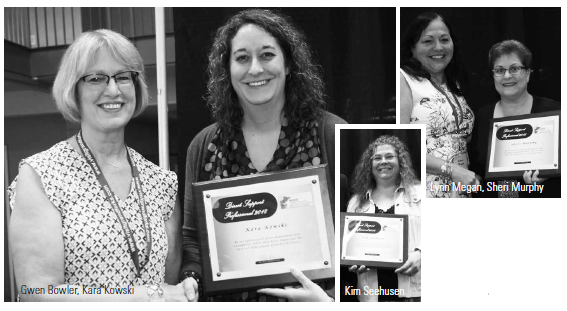 Five Minnesota direct support professionals (DSP) were honored with awards at the Minnesota Organization for Habilitation and MOHR Summer Conference in St. Cloud. MOHR includes more than 100 adult day, day training and habilitation, extended employment, and supported employment service providers across the state. Its members serve more than 26,000 Minnesotans with disabilities. Direct training specialist Kim Seehusen with Ally People Solutions, St. Paul, was honored for enrichment focus. Growing up around people with disabilities, Seehusen said she’s made them a part of her life. “I feel like I get more out of it, sometimes, maybe even than they do.” For some individuals, the staff members providing services may be the closest thing to “family” a person has. TSE, Inc., was honored for employment service. Murphy created the Prime Time Program at TSE, which offers people with disabilities the opportunity to see different types of employment through tours in a variety of industries. With a teaching background, Murphy is adept at preparing participants, easing their anxiety and helping them to interact, said Jim Freeman, employment services director at TSE. More than 90 percent of those who have graduated from the program have gained employment. After taking behind the scenes tours of businesses in five different industries, Murphy takes people through an evaluation process before diving into a curriculum to work on skills identification and discussions about what makes a good employee. While maintaining high expectations for individuals, Murphy said she’s found there are many ways to achieve them. Job coach Renae Kappes regularly teaches people with disabilities to give back to their community. The 37-year veteran of the Norman County Developmental Activities Center (DAC) was given an award for employment services. “I love making a difference in their lives, and anything I can do to (to help), I will do it,” said Kappes. She is particularly proud of the small community of Ada, which has 22 outside job sites where people with disabilities work. “Not only does Renae excel at all of her normal day-today operations, she is always stepping up and stepping in, in ways that are not required, in hopes that she will make someone’s life better,” said Hiliary Chisholm, executive director of the Norman County DAC. While helping people with disabilities to learn their jobs, Kappes also works with employers to support them, and to uncover new job opportunities. As an exemplary job developer in the western suburbs who greatly impacts people with disabilities, Kara Kowski was honored with an employment services award Kowski builds relationships with employers and referral sources and helps individuals to prepare for work and understand work expectations, said Andrea Pearson of Opportunity Partners. Kowski helps people with disabilities to find jobs. She also supports them through follow-up visits and other assistance once they are employed. “Before Opportunity Partners, I worked in the school system, so the skills transferred over,” said Kowski. In her seventh year with the nonprofit, she’s also helped job placements to expand their work hours and coordinate the timing for services and other activities outside of the work day. Kowski advises the individuals she serves that they need to learn to talk to employers face to face. Rita Cassens, a substitute who works across multiple departments at Mille Lacs County DAC, was given an award for enrichment focus. Cassens brings a person-centered” approach to all that she does, working in the DAC’s production, living skills and community rooms, and providing job coaching for enclaves or work crews in the community. “Rita is capable of getting people excited about doing a job that they may not prefer,” said Kyrah Nelson, designated coordinator at the DAC. Sometimes, it can take some time to determine what someone with a disability wants. Cassens doesn’t walk away, but tries to figure it out. Building happy lives is at the center of her work plan, and the job offers variety, which she likes. Cassens has a sister and a niece who attend the DAC. She has worked there for 21 years. MDI has begun filling 160 positions at its locations in Grand Rapids, Cohasset, Hibbing, and Minneapolis. This is due to a surge in postal service orders coupled with a steady increase in commercial sales. MDI manufactures standard and custom corrugated plastic and provides assembly and environmental services. The organization currently employs more than 400 people, with nearly half of its workforce comprised of people with disabilities. It touts an impressive 96 percent employee satisfaction rating. MDI has spent the last several years modernizing equipment, facilities, and investing in employees to prepare the organization for new diversification and growth. This process has included the purchasing of a new building in Cohasset; installation of new equipment in Grand Rapids; expansion of employee services through career skills training and the building of a new facility in Hibbing. The New York-based Camphill Foundation Board of Directors has appointed Karen Murphy as the organization’s executive director. Murphy, an experienced nonprofit executive with expertise in fundraising, management, and disabilities advocacy, succeeds Shelley Burtt. Burtt served from 2010 to 2018. Murphy worked as director of operations for the Fellowship of Reconciliation in Nyack, New York. Murphy also has extensive nonprofit fundraising experience. From 1999 to 2006, she worked at strategic fundraising consultancy CCS Fundraising, where she led capital, annual, and endowment campaigns for organizations such as Doctors Without Borders and the Archdiocese of New York. She has a long history of work with people with developmental disabilities and mental illness. Camphill operates more than 100 communities around the world, including Camphill Village Minnesota near Sauk Center. It is a life-sharing, residential community of 50 people, including adults who have disabilities. Its community is deeply rooted in the belief that every individual, regardless of limitations, is an independent, spiritual being. Tim Thurn and Jim Manders have completed a successful charity bike ride from Minneapolis to Bismarck. They raised funds for the Parkinson’s Foundation Minnesota. The route was chosen because Thurn and his wife Jan live in Minneapolis. Jan Thurn has Parkinson’s and the disease has affected other members of her family. Manders’ brother, Charlie, lives in Bismarck and also has Parkinson’s. Charlie Manders is a longtime friend of Tim Thurn. The men are using the 450-mile bike trip to raise funds, raise awareness of Parkinson’s disease, to highlight the need for more research to develop more effective treatment options and ultimately find a cure. They biked for about 75 miles each day and made stops to raise awareness of Parkinson’s. They also met with community groups. All money they raised goes to support research. The ride route was along Interstate 94, including St. Cloud, Alexandria, Fergus Falls, Fargo, Valley City, Jamestown, Bismarck and the surrounding areas. Reva Jones-Simmons and Natalie Beazer are the new co-chairs of the Olmstead Implementation Office’s Community Engagement Workgroup. Jones-Simmons and Beazer will be critical in helping guide the completion of the workgroup efforts, and attended their first meeting in July. They began their work with an introduction to the community engagement evaluation process facilitated by the Improve Group, and attended the first sub-cabinet meeting. The Olmstead work is to make the state, and state agencies, more inclusive of Minnesotans with disabilities and to help people, live, work and play in their home communities. More information about Olmstead meetings can be found at mn.gov/olmstead. 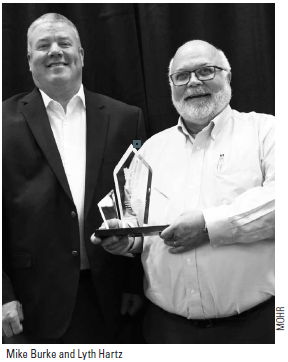 Lyth Hartz, president of MSS, received the 2018 Tip of the Spear Award from the Minnesota Organization for Habilitation and Rehabilitation (MOHR). The statewide honor recognizes individuals who have made an impact and inspire others to take action benefiting individuals with disabilities. “Lyth’s exemplary track record of a half century of serving and supporting people with disabilities is a certain exemplary of our Tip of the Spear,” said Lynne Megan. She presented the award at the MOHR Summer Conference in St. Cloud. Hartz was in the forefront of the movement to transition people from the state institutions into community-based programs. Hartz said he was honored to be nominated by his staff members It is the people with disabilities they support and their families who are his inspiration. He added that one special thing about MSS is that he and other administrative staff have their offices in the same areas where the individuals with disabilities receive services. Hartz is a firm supporter of the concept of choices for the people impacted by programming. “I’m hired to support their version of what their life should be,” said Hartz. “It’s inspirational.” People with disabilities are some of the most genuine, “real article” people one can meet, he said, noting that the general public can benefit greatly from getting to know these individuals. MSS is known for the more than 100 artists with disabilities who participate in The Show Gallery Lowertown in St. Paul. Hartz has been an unwavering supporter of the arts. He’s also been active in a number of community organizations, including Civitan in St. Paul, which he founded in 1980. Hartz also has served as a speaker for the United Way, a Boy Scout scoutmaster and is an active member of his church.